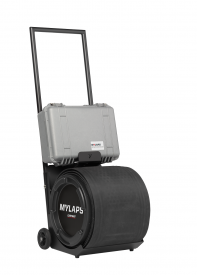 (HAARLEM – February 6th, 2019) – MYLAPS introduces the EasyMat, the latest innovation in sports timing for the active sports industry. This new timing mat saves time and energy since it’s both fast to place on the track and easy with transportation. No more heavy lifting of timing mats, no more bending down on knees to connect cables. The EasyMat is rolled out in one movement and connected to the decoder before you can blink an eye. The EasyMat is an innovation that helps set up your timelines faster than you could ever imagine. The rollable formula enables you to deploy the timing mat with one movement. The cabling is integrated within the mat, so there’s no more manual cable handling needed. The short setup time (within 1 minute) means minimal road closure time before and after the race. The mat is compatible with both the MYLAPS BibTag and ProChip systems, which makes it a convenient solution for multiple sports and their unique timing needs. The flat design guarantees safe passing for all sports.